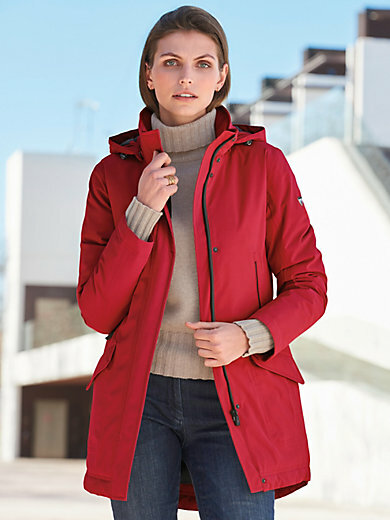 Rain jacket by FUCHS & SCHMITT. Sporty look in parka style. Removable hood with press studs, drawstring and stoppers. High-closing collar. Zip fastening. Concealed press stud placket. Drawstring with stoppers on the hem. 2 diagonal zipped front pockets. Roomy flap pockets. Inner zipped pocket. Outer material, padding and lining 100% polyester. Length approx. 34ins. The rain jacket is machine washable.